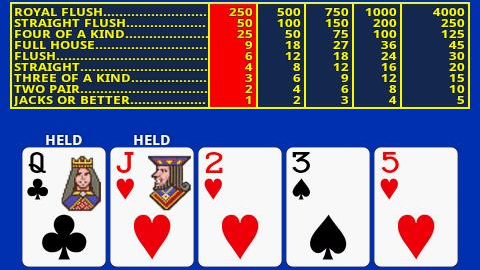 Video poker is one of the simplest forms of poker that can be found. It follows the rules of straight poker. This is where the player receives five cards, and they get the chance to change some of the cards in their hand to try and improve it. However, instead of playing against other players, you would be playing against yourself; as you are trying to get the best possible hand in order for higher payouts. It is truly entertaining to play video poker, as you try and select the cards that will not offer you a big advantage. Much like slot games, video poker has payout tiers depending on how much you bet. You can clearly see these payout levels on the screen as you play, so it makes it easier to place your bets based off of how lucky you are feeling. The advantage of playing video poker as opposed to other forms or variants is the fact that you don’t have the human element involved. Having other players in the mix will certainly complicate the way a game will progress. There is also the added bonus that, being a machine, you can win the jackpot.